Foot Locker earnings beat on both the top and bottom lines. Same-store sales missed Wall Street estimates. Watch Foot Locker trade in real time here. Foot Locker‘s beat Wall Street estimates on both the top and bottom lines in the second-quarter, but same-store sales came up short. Shares are little changed in early action on Friday. The sneaker retailer earned an adjusted earnings of $US0.75 a share – $US0.05 ahead of the estimate from Wall Street analysts surveyed by Bloomberg. Foot Locker also said sales increased 4.8% to $US1.78 billion, edging out the $US1.76 billion that was expected. Excluding the effect of foreign exchange rate fluctuations, total sales for the second quarter increased 3.9%. The lone blemish was the 0.5% increase in same-store sales, which missed the 0.7% gain that was anticipated. “Our performance reflects the work we are doing on several fronts to position the Company to succeed in a rapidly evolving retail environment,” CEO Richard Johnson said in the earnings release. The company is able to sell products more quickly. In the quarter ended in June, the Company’s merchandise inventories were $US1,254 million, 2.8% lower than last year’s. 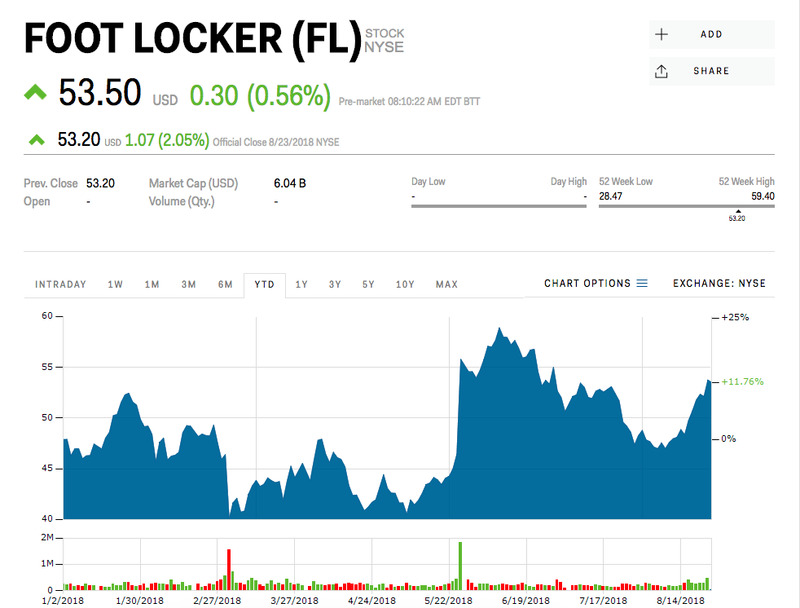 Foot Locker also said it opened 13 new stores, remodeled or relocated 33 stores, and closed 21 stores in last quarter and now operated more than 3000 stores in 24 countries. Shares of Foot Locker were up 13.5% this year through Thursday.